The National Memorial for the Preborn and Their Mothers and Fathers will take place in Washington, D.C., on the morning of the annual March for Life. 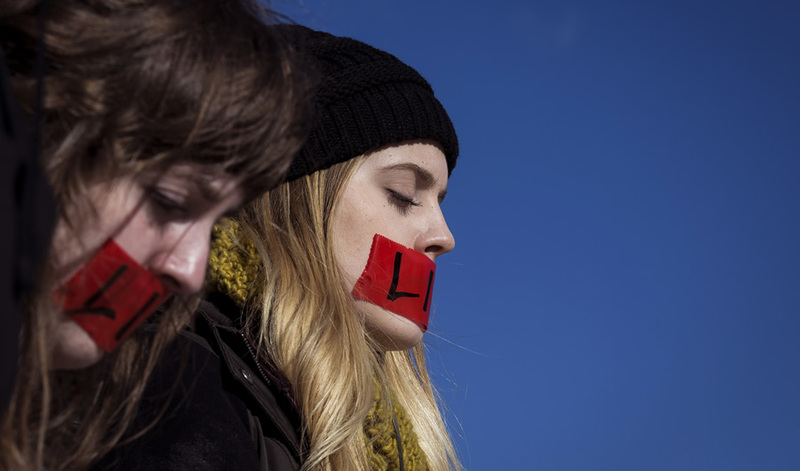 Pro-life advocates stand in protest outside of the Supreme Court, March 2, 2016 in Washington, D.C. There is no more urgent work in the contemporary culture than the work of the movement properly called pro-life. That is precisely because the right to life movement is the foundational human — and thus civil — rights movement. We have failed to hear the cry of our youngest neighbors in the first home of the whole human race. When we allow their killing for any reason and by any means — and then actually call it a “right” — we profane the very word. We also place our future survival as a nation at risk. The right to life is the fundamental human rights issue of our age, because without it there are no other rights. It is also the great freedom movement of our day because without the freedom to be born, there are no other freedoms. Forty-four years ago, with the stroke of a judicial pen, seven justices of the United States Supreme Court consigned an entire class of persons, children in the first home of the whole human race (their mother’s womb), to the status of property. We cannot, we will not, stop in our efforts to defend these children and to end this evil. When we are victorious in this monumental struggle — and we will be victorious — there will be many heroes whose sacrifice and courage will be recounted in our history books. Right at the top of that list will be Catholic priest Fr. Frank Pavone, founder of Priests for Life. Like David of the Old Testament, Fr. Frank Pavone has wielded his small smooth stones to sling mightily against the Goliath of the contemporary culture of death. That giant — Planned Parenthood — now staggers as a result. On the day when we gather in Washington, D.C. to mourn the forty-fourth anniversary of the U.S. Supreme Court decisions of Roe and Doe, I can think of no place I would rather be than by the side of Fr. Pavone. And I will be, beginning at the National Memorial for the Preborn and Their Mothers and Fathers. He will preside at this extraordinary service, to be led by clergy and lay leaders representing the fullness of the Body of Christ: Protestant, Orthodox, Catholic and Evangelical. If you are coming to D.C. for the march, you need to be there as well. Memorial service details: 8:30-10:30 a.m. ET. Constitution Hall, 1776 D St., NW (18th and D St) Washington, D.C., 20006. The new March for Life Rally starting point is only a short walk away from this location. This memorial service will be a wonderful example of authentic and respectful Christian unity and a prophetic sign of the coming answer to the Prayer of our One Savior, Jesus Christ, “May the Be One,” (John 17:20,21) and will include prayer, preaching and praise to set the day apart for the Lord. It is free — no tickets are needed and large groups are welcome. For those who wish to attend, a Catholic Mass will be celebrated at 7:30 a.m., before the prayer service, where Fr. Frank Pavone will also preside. The great civil rights movements of the past two centuries have depended upon the recognition of an objective truth; every human being, at every age and stage, has human dignity and a right to life. Every procured abortion is intrinsically immoral because it takes an innocent human life. It is always and everywhere wrong to take innocent human life. Medical science confirms what our conscience has always known; the child in the womb is one of us, our neighbor. No positive or civil law can ever change that fact. When they purport to do so, such laws are unjust laws which are not law at all. The great civil rights movements of the past two centuries have depended upon the recognition of an objective truth; every human being, at every age and stage, has human dignity and a right to life. Civil rights are those human rights which are first recognized — and then properly protected by — civil government. The American founders believed this and stood in the trajectory of Western civilization with its Jewish and Christian roots. They affirmed that human rights are not given or bestowed by government, but by the God in whose image we have all been created. Truly just governments are instituted precisely to secure these rights. With this new presidential administration comes new hope and opportunity for our struggle to end the evil of legalized abortion and once again recognizing the right to life of our neighbors in the womb. But we must gather together to pray to the Lord of life — and then walk that prayer into advocacy and action together. Come, join us, at the National Memorial for the Preborn and Their Mothers and Fathers.